Accumulation of biomass as well as the pools and fluxes of nutrients change along the chronosequence. Generally, ecosystem processes do not change linearly with stand age because they are affected by several factors such as forest composition, development stages and mortality caused by spruce budworm outbreaks which changes the forest cover. Forest composition has important effects on ecosystem processes because the main tree species contrast by their growth rates, their nutrient requirements and by the quality of their litter. Among all species, aspen produces the greatest amount of biomass and favors a greater cycling of nutrients within the ecosystem. At all stages along the chronosequence the total stand biomass is correlated with the proportion of aspen biomass (Table I). Furthermore, this species has high calcium (Ca) requirements (e.g. : Ca in aboveground biomass of 60 year-old aspen @ 900 kg/ha compared to 300 kg/ha for jack pine) and favors a high forest floor pH (pHH20 : Populus=5.55 : Betula=5.06 conifers=5.07). 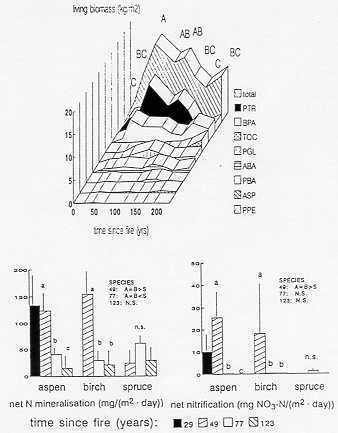 The soil acidifies during the aggradation phase (75 years) and then remains relatively stable (Table I). However, soil acidity greatly varies spatially in relation to forest cover. Net nitrogen mineralization and potential nitrification were found to be higher under deciduous stands with a N rich litter but these differences disappeared with stand age (fig. 1). A massive woody litter input to the soil, corresponding to the decline of the first aspen cohort, could explain the lack of differences between species in older forests. Species effects were found to be generally similar on till and clay deposits. 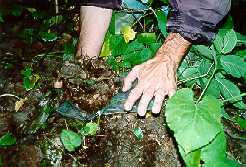 However, the clay soils contain greater pools of nutrients and the fine particles stabilize greater amounts of carbon and nitrogen. Ref. : Brais et al., 1995 ; Paré & Bergeron, 1995; Paré & Bergeron, 1996. 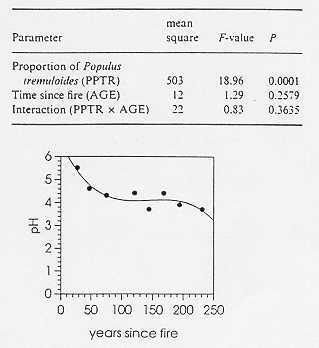 Table I. Regression analysis for the effects of the proportion of Populus tremuloïdes, time since fire and their interaction on estimated above-ground tree biomass prior to the spruce budworm outbreak. Fig. 1. Changes in the amount of living above-ground biomass along the chronosequence (per species and total). Means of the total amount topped by the same letter are not significantly different.